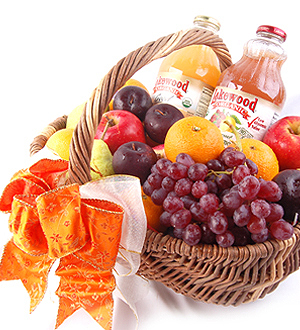 A fruity selection of 5 varieties of fruits with 2 bottles (1 litres each) of Lakewood's Organic Healthy Juices - Cranberry Lemon Pressed Blend and Morning Anti Oxidant Blend of Pineapple, Tangerine, White Grapes, Banana and Peach. A truly vitamins packed goodies for an active guy. Free delivery available within Klang Valley only. Lakewood juices featured available for delivery within Klang Valley and nearby vicinity only. For other States, the brand of juices and presentation is subject to availability. Call 03-78830233 / +6012-6915200 for more details.